It’s the first question that comes to mind when the RSU comes up. 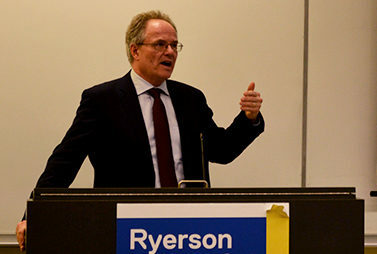 In the past four years at Ryerson, the students’ union has acted less like an open and accountable student government and more like a bureaucratic collective that is notorious for dodging questions and restricting interviews with the student press. An upcoming election usually holds the promise of change, but in order for there to be change, there have to be options. Only one slate is running in the election, with a representative for each position in the executive. The four vice-president positions are uncontested and based on a yes or no vote. The slate, Unite Ryerson, is a thinly rebranded Students United. If one of the independent candidates was elected president, they would be the outlier in a predominantly Unite Ryerson union. The RSU slogan, “your union, your choice,” loses its meaning when there’s only one party running. The RSU elections have a voter turnout of about 10 per cent each year, meaning that of nearly 35,000 students, only 3,500 play a role in deciding who governs the student body. This unfortunately low number is at least in part due to the inaccessibility of the RSU’s voting process. Ryerson is well known as a commuter campus, with many students coming from outside the downtown core. Being on campus during election days is not always feasible for them, or is simply inconvenient. Unlike the school’s other governing bodies, the RSU doesn’t have an online voting system. Current RSU president Melissa Palermo asserts it’s to assure the validity of the voting process, but the senate and the board of governors have conducted online voting with no problems and a higher voter turnout. This type of inaccessibility points to one of two disturbing possibilities: either the RSU has opted out of online voting in order to shamelessly cater to non-commuter students, those 3,500 who are downtown, able to vote, and continually support the same party; or else the former Students United party has no concept of the nature of Ryerson and its community, which demonstrates how ineffectual, obsolete and unfit to lead a student body it is. The indifference also stems from the one-sided nature of RSU elections. It’s impossible to walk through campus without being bombarded by Unite Ryerson posters plastered over nearly every inch of wall space, leaving little room for the opposition’s scarce campaign. This, and past years’ results deter students from voting if they already know what the result will be. So should students vote? Does voting really matter? While supporting this democratic right is important, voting just to vote, not to actually achieve results or change, is an insult to the practice. There is no point in supporting a party that neither knows nor caters to its constituents. This story was first published in The Ryersonian, a weekly newspaper produced by the Ryerson School of Journalism, on January 29, 2014.